Italian railway workers were on a 24-hour strike on Friday 26 October, called by ETF affiliate unions Filt Cgil, Fit Cisl and Uiltrasporti. Workers who walked out for the protest included those with sub-contracted roles in on-board catering, the preparation of night trains, assistance for disabled passengers and cleaning services for trains, stations and offices. The strikers called for social protection and decent working conditions for all sub-contracted rail service workers. 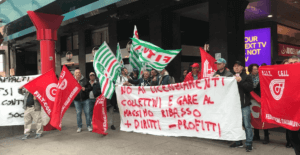 This was the third strike within the past four months organised by the three Italian unions, and protests against outsourcing and worsening working conditions took place all over the country. Like the two previous national strikes in July and September 2018, the October strike fought against the tendering of service lots with excessive discounts, continuous contract award procedures, the non-application of social and employment clauses, and the exhaustion of social security benefits. The ETF and affilates around Europe supported the more than ten thousand Italian railway colleagues affected with an open solidarity message. ETF Railway Section President Giorgio Tuti made it clear how important European solidarity is in this struggle. “We hope that the Italian workers soon win this battle to give dignity to their occupation, so that they obtain the necessary contractual guarantees, wages, regulations and safety. With the opening of competition in the European railway market, the quality of the jobs in the sector, in every single country, now also has a direct connection with and a strong impact on the railway workers of other countries”. Italian and international media covered the strike and its impact. The demands of the Italian railway workers are fully in line with the ETF’s Fair Transport Europe campaign, which sees European transport trade unions standing together to demand quality jobs for workers and a safe, reliable service for customers.